The Tri-Hunter 6000 is a continuous blending Trimix and Nitrox mixing stick in a league all of its own. It eliminates expensive and inefficient partial pressure gas blending. Due to a proprietary electronics/software package known as the Accublend, it is the only mixing stick that does not require you to drain the existing mix from your tanks. Instead you can top off an existing mix and save expensive gas. 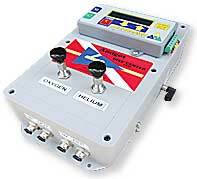 Additionally, this device works with your compressor, making a Haskel unnecessary. 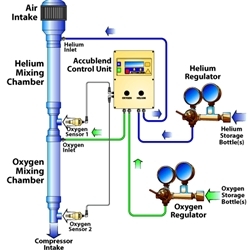 Two high performance regulators are provided for oxygen and helium supply bottles. Each regulator has a precise, 20-turn needle valve that allows you to fine tune your oxygen and helium percentages, which are then fed to the mixing stick, mixed and run through your compressor to the tanks. These high performance regulators will drain a supply bottle to 15-20psi (1-1.5 bar) eliminating the need for an expensive Haskel. The auto calibration button is pushed while the compressor is running. There is any loss of power to the Accublend electronics box. The O2 sensor reaches 39.9percent. The sensor cables are unplugged. The Tri-Hunter software program gives you the ability to calculate top off mixtures for existing Trimix or Nitrox and also gives equivalent narcotic depth and PO2's. 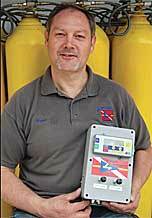 The ability to modify existing Trimix or Nitrox mixture without draining the cylinders saves valuable time and money. For example, if there is 15/55 residual gas and you want 21/35, you can simply top off the residual mix to get what you need. The Tri-Hunter software also allows you to set pricing for your gas and automatically calculates a price for each fill. The Tri-Hunter retails for $3,200, which includes the complete package of regulators, electronics, built-in safety features and software. We stand behind our product with a one year guarantee on the electronics and a limited lifetime warranty on the mixing stick. Orders require $1,000 deposit and delivery time is typically three to four weeks. All electronics are built on a per purchase basis.